Q. What can i do if my safety switch (RCD) won’t reset? Physically unplug all appliances that are not powered up (i.e. all appliances on the tripped circuit), and then try to reset the RCD. If the RCD still won’t reset and you are sure that all appliances have been unplugged, Contact Us by telephone if the matter is urgent. We have special test gear to determine whether the Safety switch is faulty or whether you have a problem in your wiring. If the RCD has successfully reset, you can begin plugging your appliances back in, when the RCD trips again you can identify the faulty appliance. TIP – turn on a radio or TV first so that you can hear when the power goes out (due to the RCD tripping when the faulty appliance is plugged back into it’s socket). Do Not Use any faulty appliance, particularly if it is tripping your safety switch, it is potentially dangerous and should be inspected by an electrical contractor. Q. How often Should I test my Safety Switch (RCD)? Most manufactures of RCD’s recommend testing RCD’s with their integral test button once every month. This ensures that the mechanism which allows fast disconnection of supply does not become stuck (a problem which frequently occurs close to the beach in areas of the Sunshine Coast). The Australian Standard AS3760 advises, for residential use, that RCD’s be tested with their integral test button once every 6 months, and the operating time be measured (with special test equipment) once every 2 years. Contact Us to arrange testing of both the operating time and operating current of your safety switch. Work places are subject to much more frequent testing than residential, the frequency of which depends on the nature of the work environment. Contact Us to find out your specific requirements and arrange testing of both the operating time and operating current of your RCD’s. Q. How can i reduce my electricity usage? Ensure that your hot water is not connected to your general supply tariff, off peak tariffs are are available for electric hot water systems where they are of sufficient water capacity to hold heat (like a heat battery) when the Supply Authority has them switched off during peak times, furthermore solar hot water systems with a Gas or Electric booster can reduce your energy usage substantially. Be religious about turning off lights that are not required (unoccupied rooms etc). Replace incandescent light bulbs with Compact Fluorescent Lamps (CFL’s) – these energy saver lamps typically use 1/5 th of the power of the old incandescent bulbs whilst putting out the same amount of light. Recessed downlights can also be replaced with CFL’s (although you will need an electrician to do the 240V wiring), not only do they use less power, but they generate less heat and pose far less fire risk than halogen downlights. Use heating appliances conservatively – don’t boil a full kettle of water if you are only using 1/4 of a kettle, don’t use the clothes dryer unless it’s really necessary, wear slippers or warm clothing instead of putting on the heater whilst wearing only your undies. Check the energy star rating of new appliances when you are buying them (the more stars the more efficient the appliances are). Check the Wattage of the appliances you use to give you an idea of how much electricity they use (e.g. a 2400W kettle uses 100 times the amount of electricity as a 24W light if they’re operated for the same amount of time). Ensure that your fridge and freezer door seals are in good condition (not torn & still have good magnetic stick), door seals are relatively inexpensive to replace if need be. Turn off appliances when not needed, some appliances use no stand by power at all, some use quite a bit, if in doubt, switch it off at the power socket. Remember that any appliance that gives off heat is using power, the more heat that is given off the more power is being used. This also applies for moving heat (e.g. fridge, air conditioners – the more heat that you’re moving, the more power you are using). Put items such as the pool equipment, clothes washer, clothes dryer and dish washer (if you like) on an off peak tariff (the items will need to be permanently connected with a separate circuit back to the switch board), Energex will turn these items off between 5:30pm and 9:30pm during peak demand times, but you will get a cheaper rate for electricity for these items, also it immediately decreases your normal tariff demand which allows you to feed more power to the grid if you have a grid connected solar power system. Monitor your energy usage by installing a wireless energy monitor, or simply take readings of your electricity meter to see how your changes of habit can change your electricity usage. If there is more than 1 meter in the meter panel, make sure that you are reading the correct meter by checking that the meter number corresponds to your general supply tariff, which for domestic supply is T11 on your electricity bill. (On the example at right 456511 is the meter’s identification number). Before taking the reading of each of the dials, make sure that you know which way the dial rotates (they don’t all go the same way). Check this by looking at where the needle is on the dial, in the example – the dial furthest to the right (with the black needle) is between 6 & 7, always take the smallest of the two numbers (6 in this case) because the dial hasn’t yet reached the larger number. If the needle points more or less toward a number you will need to look at the next dial which has a smaller unit (smaller units have better resolution) to work out if the correct number is the number the needle points to or the one below it. (e.g. the dial in the example which registers units x1000 (with the black needle) points at 7, you must look at the next register (for units x100) to see whether it’s needle has already gone past the 0 or not. The register for units x 100 is pointing to 8 (has not yet passed the 0), confirming that the previous register (for units x1000) is in fact a 6. Now we must look at the register for units x 100 which points to an 8, the next smallest register (for units x10) is pointing between 0 & 1 (has passed 0) confirming that the previous register for units x100 is an 8. 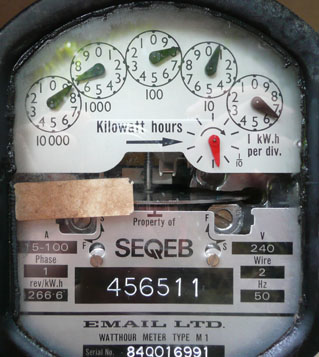 For recording Daily usage you should only need to read the 3 units furthest to the right which are the smallest units displayed; on the example these are the dial with red needle (which represents 1/10th of a kWh per unit), the dial furthest to the right with the black needle (which represents 1 kWh per unit), and the dial 2nd from the right with the black needle (which represents 10 kWh per unit). If there are no values marked on the 1/10th dial (as in the example), assign the top of it’s register as 0 and count in the direction of the arrow for each increment. Take note of the time and date of each meter reading so that you can remember what period of time you are measuring your usage. Try to take meter readings as close as possible to the same time of the day to reduce error if you are trying to gauge your daytime usage for Solar Bonus Cost Savings. Our Solar FAQ page has great info on how solar power works and a Consumer’s Guide to Purchasing Solar Power Systems.